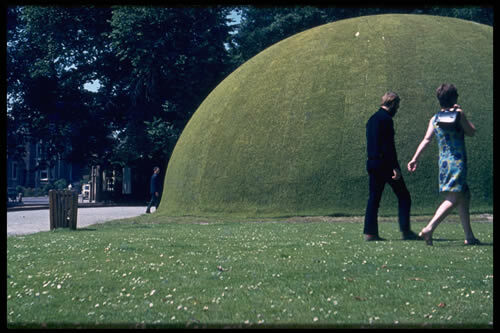 The matrix used in the fabrication of these domes is made from an inflatable vinyl structure whose frame is composed of plastic pipes pierced all around. Once this is arranged on a frozen flat surface of water and equipped with a rechargeable battery, it is connected to a blower that inflates it with air and to a “heating” pump that collects the water under the ice and circulates it into the pipes. A fog disperses and covers the surface which, upon contact with the air (-10 to -20 degrees Celsius), is transformed into a fine film of ice in about twelve hours. Once the transparent shell stabilizes, the matrix is then deflated and reused for a new dome. Each dome has a six metre diameter and a height of roughly two metres, and the ice layer that contains their dwelling should reach a thickness of four centimetres at its base and six centimetres at its peak. The ice domes correspond with the utopia of creating nomadic and autarkical dwellings in the form of a “survival kit” adapted to our harsh climate.